South Africans have in recent months experienced many traffic delays, disruptions and at times total road closures brought about by protests, riots and incidents of public violence. These protests were related to service delivery, education issues, politics and several social issues. 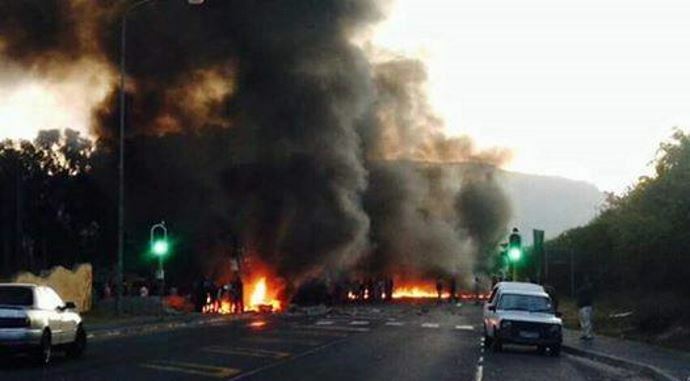 It has been reported in the insurance industry that up to 80 percent of protests which have taken place in South Africa over the last decade were unfortunately associated with violence and many innocent bystanders sustained damages to their properties, cars and personal belongings. On the Arrive Alive website, we share information on “Roadside Emergencies and the Sudden Unforeseen Stop” with some important insights on what to do in an emergency. But how should we drive and how can we adjust our driving in areas of protest and public violence? Safety always starts with planning - The best way not to become part of any unrest situation is to not be there in the first place. If you are aware of trouble in an area and it is not essential to travel, rather delay your journey or find alternate routes. Monitor media and social media and listen to the local radio station for radio reports and traffic updates. If in doubt about the safety of an area, phone a police station in the area for advice. On the national tolled roads, the toll concessionaires have call centres that are operational 24/7, offering regular updates on social media platforms such as Twitter. Limit your trips at night or at least take someone along with you. Many of the recent incidents of public violence on our freeways have taken place under the cover of darkness. During daytime, there is increased visibility allowing more time and space to respond to emergencies. Be extra cautious when accompanied by people with special needs such as children, the elderly or a passenger who is pregnant. Have enough water in the vehicle to remain hydrated during travel delays. GPS devices or apps on smartphones may also provide invaluable guidance on routes for detours. Ensure that your vehicle is in a good condition when you plan to go on a journey. Ensure that the fuel tank of your vehicle always has sufficient fuel. Always lock your vehicle's doors and keep the windows closed. Do not be seen using your cellular phone – Rather use a hands-free kit. Do not leave valuables such as handbags and briefcases within clear sight of anyone approaching your vehicle. It’s important that anyone driving in an area that may be affected by unrest understands that the SAPS will most probably have blocked off a road to prevent entry. Trust and obey the instructions from police and traffic officials. Don’t put yourself in any danger by disobeying them. If traffic has become congested – do not drive in the emergency lane thereby endangering the lives of those who may need urgent medical attention. Check for possible escape routes you can use‚ or for a police presence that you can approach for assistance. Stay in your car for as long as possible. Unbuckle your seatbelt‚ and those of any passengers‚ to be prepared to exit your car quickly when needed. Keep your car moving as far as you can‚ whilst checking for possible escape routes. If you find yourself heading into the path of a crowd, and it is possible - turn down the nearest side road, reverse or turn around and drive away calmly. Remember that conflict can only continue to exist with participation – the protest may have nothing to do with you - do NOT participate. Be vigilant always and ensure that protesters know you pose no threat and are merely trying to pass through. Drive defensively with the required patience for the situation. Pay attention to the road surface and where you drive - You do not want to get stranded with a tyre puncture or from a collision into another vehicle. Avoid hitting any protestors with your vehicle as this may turn the mob against you. Do not taunt the protestors with provocative gestures such as shouting‚ gesticulating or hooting at them. Remain as calm as possible to ensure you are aware of what is going on around you. Seek assistance or safety from the police as quickly as you can. If you do not see the police‚ call them. Always remember that your life is irreplaceable and worth more than any earthly possession. If you are stuck and the situation seems to be turning‚ leave your car and get out of the area on foot. Do not try to carry baggage away from your vehicle - Your life is more valuable than your car or any possessions inside. Do not resist and become confrontational. Once you are personally safe (with or without your vehicle) call family or friends to let them know where you are‚ and what is happening. Do not drop your vigilance once you have left the scene of unrest. Leave the scene swiftly but cautiously. Buckle up and don't get distracted! Traffic may remain congested in what is often deemed a "traffic tsunami" after road closures. Be cautious of agitated and impatient road users taking chances once the road has cleared. Drive defensively and remain alert to traffic, road and weather conditions. Even with the best behaviour, it is possible that you may bear the brunt of civil unrest and suffer damage to your vehicle or other property. 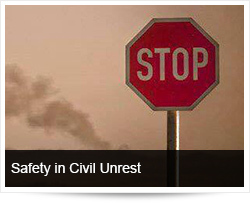 Civil unrest and public violence heighten the need for special risk insurance cover. Sasria (the South African Special Risks Insurance Association) was established and registered in terms of Section 21 of the Companies Act in 1979, in response to the political unrest of 1976. Sasria is the only insurer in South Africa that provides cover for riots, strikes, terrorism, civil commotion and public disorder to corporate, commercial and individual policyholders. It is important for those with short-term insurance to verify with their brokers and insurers that Sasria cover is included in their underlying policy. Consult with your insurer and request confirmation that insurance provisions are correctly structured to avoid financial damages. Sasria cover is applicable to personal property such as vehicles, homes and household contents, as well as commercial and government property. What do you need to know about Insurance Claims for damage during riots and strikes?